In this brief post, I will make only a few observations. The trustworthiness of Scripture was confirmed to us in ways both big and small. To give but one example, we read that wicked king Jeroboam built an altar to the god Baal at the city of Dan (1 Kings 12:25–29). Thanks to archaeologists, we were able to stand at the ruins of that altar and contemplate the lessons we should learn from Israel’s sin. Jeroboam built the altar to maintain the loyalty of his people and not risk them defecting if they went to Jerusalem to worship. So he justified his evil by saying that the people could still worship Jehovah along with the golden calf. Just like many today, he convinced people that there was room in their hearts for two thrones. 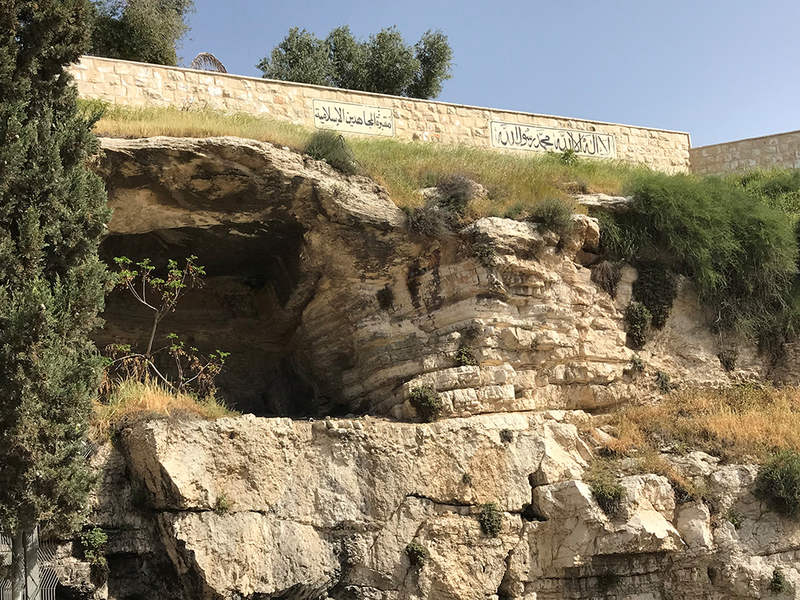 Whether it was the five porches of the pool of Bethesda, the excavations in Caesarea that confirmed the existence of Pilate, or the Dead Sea Scrolls that confirmed the accuracy of the scribes in copying the Scriptures—in these and countless other ways, archaeology keeps proving the reliability of Scripture. No other religion is so deeply rooted in the soil of history as the Judeo-Christian teachings, and no other religion has as much empirical proof that its claims are true. I was again reminded of the complexity of the Israeli/Palestinian conflict. About 20% of the eight million people who live in Israel proper are Palestinians. For example, we visited Nazareth which is almost 100% Muslim. These people enjoy all the rights of Israeli citizenship, including the right to vote. They prefer living in Israel rather than an Arabic country like Jordan, Egypt, or even the so-called West Bank that includes the Gaza Strip, which is ruled by the Palestinian Authority. The matter is too complicated to discuss further here except to say that at best, there is always an undercurrent of religious and racial tension in this land; at its worst, history has shown that these tensions can erupt into violence. Politically, Israel is divided. In random discussions, we talked with Israelis who were in total support of President Trump’s announcement to move the American Embassy from Tel Aviv to Jerusalem; the Muslim population is opposed. As for Netanyahu, he is popular among the Israelis although he is fighting some serious legal battles that could put his future as Prime Minister in jeopardy in the next election. Whenever possible, Islam seeks to spite Christians and exert its supposed superiority over Christianity and Judaism. The official teaching of Islamic leaders here is that Jewish temples never existed and the Holocaust is a hoax so Israel has no right to the land. 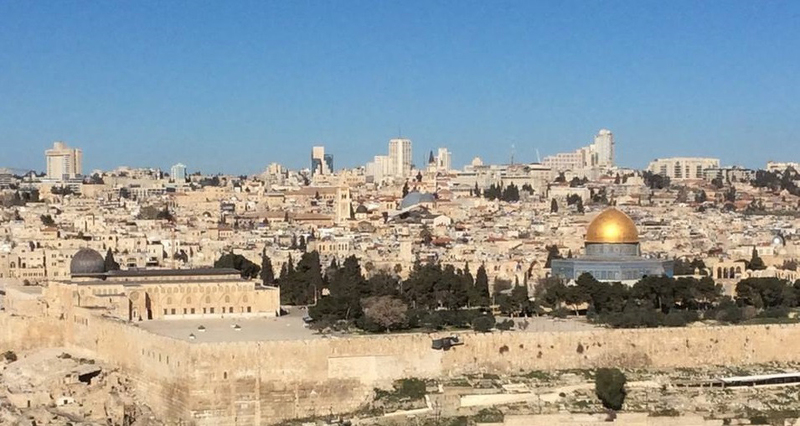 Call me pessimistic, but I don’t believe that a lasting peace is possible in the Middle East until Jesus Christ returns to the Mount of Olives to establish His kingdom. While the average Muslim would opt for peace, the leaders see any peace treaty as temporary, because the vision of pushing Israel into the sea is still alive and well. Let me list a few obstacles to peace. (1) Hatred for the Jews is fanned into a flame by the teaching of the Qur’an and Hadith in which several passages berate both Jews and Christians. (2) Islam teaches that God’s promise to Abraham is carried out through the seed of Abraham’s oldest son, Ishmael, not Isaac. And finally, (3) Islam sees the world divided into two spheres: Dar as-Salaam (House of Peace) which are Islamic countries, and Dar al-Harb (House of the Sword) which are not. Such countries must be won over to Islam. And once Muslims have occupied a country, it is never to revert back to the infidels. Should that happen, a jihad must be declared to win the country back. Since Muslims occupied this land for centuries, they cannot rest unless it is returned to the Islam. Our tour group itself consisted of about 80 believers from different denominations and different parts of the United States. We had knowledgeable guides, excellent food, and wonderful fellowship. Unfortunately, a few of our number caught the flu and some of these are determined to return to Israel someday to make up for the sites they missed. Almost everyone who visits Israel wants to return. This small sliver of land called Israel (about the size of New Jersey) is the bridge between Asia, Africa, and Europe, and has been the scene of many wars—both in the distant past and more recently. As we gathered at the hill of the ancient city of Megiddo, which stands at the edge of the Valley of Armageddon, I explained why many of us are convinced that there is still a future battle that will begin here and spill over to Jerusalem culminating in the return of Christ to the Mount of Olives (Zechariah 14:1–5; Revelation 16:13–16). For reasons unknown to us, God chose the Jewish people through whom He would bless the world. He also chose Jerusalem as their capital. Throughout the last 2,500 years, this city has been the scene of great bloodshed. Here the Jews were rounded up and taken captive by the Babylonians; here the Roman General Titus starved and killed virtually all the inhabitants. The Byzantines, the Muslims, and the Crusaders each killed thousands of victims when they captured it. Today, inside the Dome of the Rock that dominates the temple area, there is a quotation from the Qur’an that heaps judgment on anyone who believes that God had a Son. But a radical change is coming. The future of this city will be restored to its rightful owner and be more glorious than its sordid past. “It shall come to pass in the latter days… many peoples shall come, and say: ‘Come, let us go up to the mountain of the LORD, to the house of the God of Jacob, that he may teach us his ways and that we may walk in his paths.’ For out of Zion shall go the law, and the word of the LORD from Jerusalem” (Isaiah 2:2–3). “Sing aloud, O daughter of Zion; shout, O Israel! Rejoice and exult with all your heart, O daughter of Jerusalem! The LORD has taken away the judgments against you; he has cleared away your enemies. The King of Israel, the LORD, is in your midst; you shall never again fear evil” (Zephaniah 3:14, 15). I believe that Jesus will reign from Jerusalem during the Millennial Kingdom, and that this kingdom will eventually be absorbed into the larger eternal kingdom called the New Jerusalem that will come from God out of heaven (Revelation 21). This is a test of the emergency broadcasting system. This is only a test. In the event of a real emergency, this would not be a test.